I didn’t know you could study music in college. What are you going to do with your degree in music? So what’s you real job? These questions often do not have simple answers, as many professional musicians earn their income via several sources. Post-secondary degrees in Music Performance, Music Education, Music Theory, Music Business, Liturgical Music and Recording Technology are some popular pathways to prepare for a career in music. 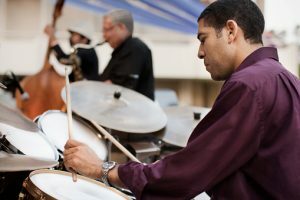 The technical abilities musicians develop through these different areas of study can lead down a variety of career paths. What careers do music degrees lead to? What transferable skills do music graduates have? Many music graduates pursue careers outside of the music—either as a “day job” in tandem with a music career, or as a different pathway altogether. And while those careers may seem to have nothing to do with music, the fact is that musicians develop a range of transferable skills throughout their intense study of music. What other skills should I develop for a successful career in music? Want to learn more? Explore other careers with CareerOneStop’s Occupation Profile.